Linear supplies of power amplifiers, particularly those with toroidal transformers and large smoothing capacitors, draw very high current when switched on. This results in the premature rupturing of the amplifiers' mains fuse. The InRush Kit is the solution. 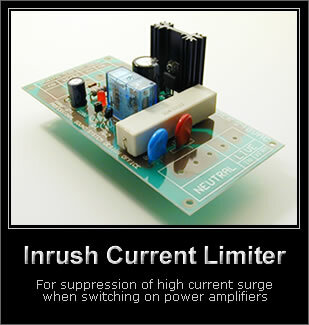 On power up, a resistor limits the high incoming current. After 1/2 sec, a relay shorts the resistor, allowing the full mains supply to be applied to the power transformer of the amplifier. The onboard 12Vdc voltage regulator can be used to power the Loudspeaker DC Protection circuitry of our 600Watts Hx350 Kit or any other accessories like the DCpro and exhaust fans. The InRush Kit requires a transformer, sold separately.